Our breakfasts consist of two light & fluffy hanky pancakes & come with your choice of one regular hot drink or an apple or orange juice. * This breakfast includes your choice of one regular hot drink or an apple or orange juice. Be inspired by our Mix & Match list! gorgeous on their own or with your choice of toppings. Here are a few combinations we enjoy but feel free to use your imagination to create a unique stack. 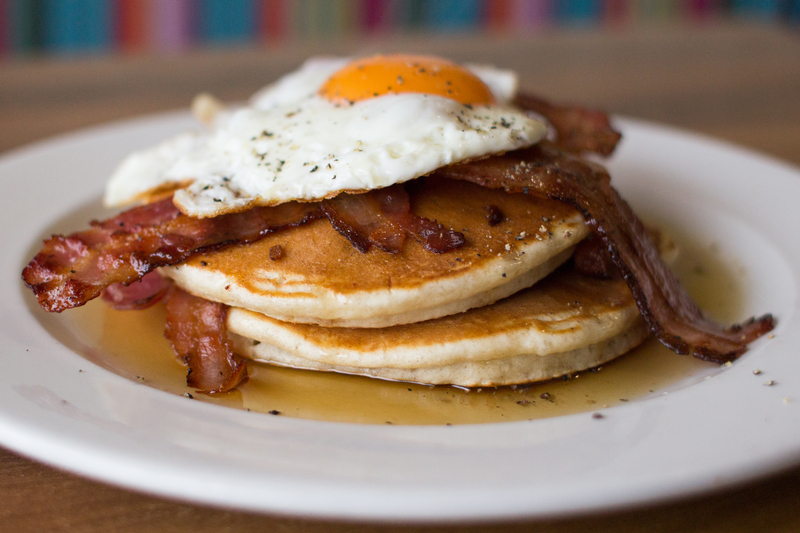 Each of these come with one pancake, why not add more to build up your stack if you’re feeling peckish? Tea from the Manor supply our tea. Chartley Coffee supply our coffee. We love them, hope you do too! Double espresso with hot milk topped with dense foam, dusted with chocolate. Smooth, rich & intense. Double espresso with lightly foamed milk. Double espresso topped with rich hot chocolate – why not top it with a squirt of whipped cream for 50p? Double espresso, cappuccino ice cream & milk, blended to create a creamy treat. Assam, cardamom, ginger, cinnamon & cloves. Oolong, Darjeeling & China Black. Green grey leaves with a slightly fruity flavour. China green tea mixed with dried Moroccan mint. Our ice cream is made just outside Chester by the award winning Backford Belles. Creamy milk from their wonderful Jersey cows makes their ice cream delicious. We have a fantastic range of ingredients with which to create your perfect milkshake. Pick an ice cream, topping & sauce & mix it all up with some milk (A pint of creamy goodness). Add a liqueur or two & give your shake even more zing! 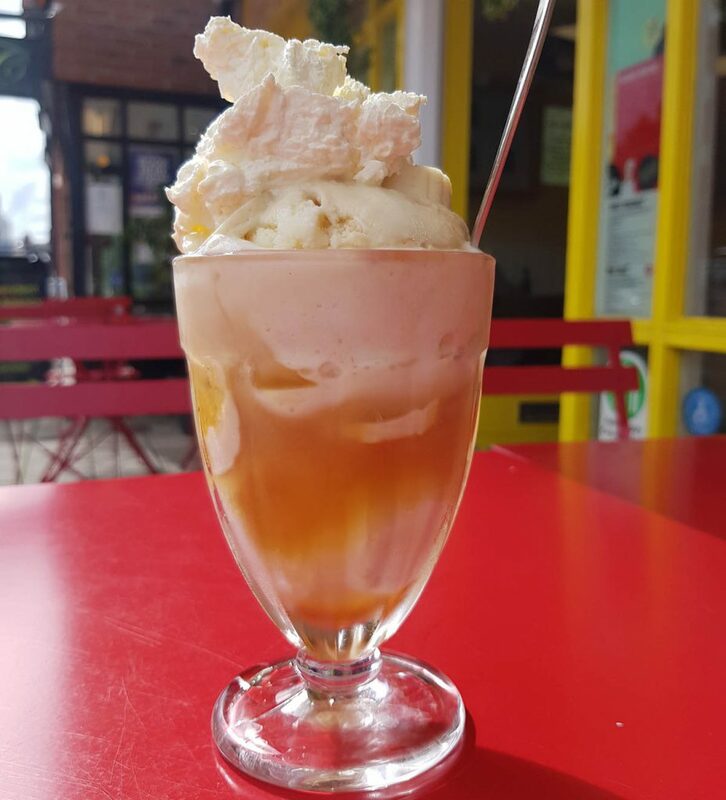 A ball of banoffee pie ice cream, a ball of sticky toffee fudge. Topped with banana & caramel sauce. PS: You know the drill! You can add more or create your own from our mix & match list! Our galettes are made using buckwheat flour – simple yet nutritious. Feel free to add to these or go freestyle using our mix & match list! A galette topped with your choice of cheese. Shredded duck, hoisin sauce, chopped cucumber & spring onions, served in a thin pancake. Tofu, chopped cucumber & sping onions with sweet chilli sauce. Served on a galette. Can you use our sweet pancakes as a savoury base? Oh yes you can. Here’s a cheeky twist on a Mexican quesadilla. Take the pancake & top it with bacon, chorizo, cheddar cheese, mushrooms, sundried tomatoes & jalapeno peppers. Olé! Classic Shrove Tuesday pancake, like a crêpe but thicker! Feel free to add to these or go freestyle using our mix & match list! Summer berries & your choice of Greek yoghurt or Crème fraîche. Banana, vanilla ice cream & maple syrup. Apple compôte, honeycomb ice cream & honey. Wild cherry ice cream, cherry compôte, wild cherry sauce & whipped cream. Lemon curd, summer berry compôte topped with orange marmalade ice cream. Raspberry jam, sponge cake & peaches, topped with vanilla ice cream. Curiosity Cola, Cherry Tree Cola, Dandelion & Burdock, Ginger Beer, Mandarin Seville Orange Jigger, Rose Lemonade, Victorian Cloudy Lemonade, Wild English Elderflower, Sparkling Raspberry. Apple & Ginger or Apple & Rhubarb. Please ask your server for available flavours. Add whipped cream for 50p. 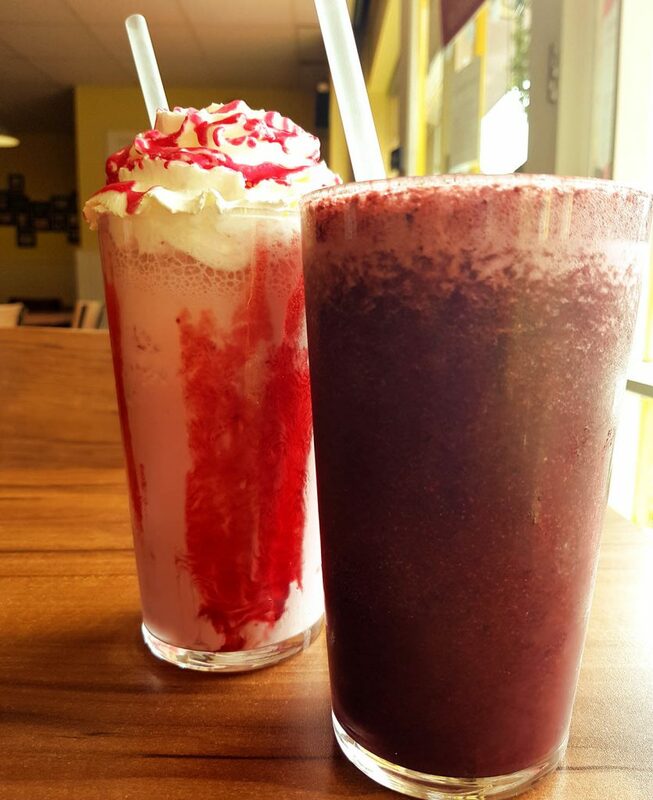 Your body deserves a little pampering, spoil it with one of our freshly made smoothies. Here’s a great opportunity to get your creative juices flowing – pick from our mix & match list to concoct your signature smoothie. Here are some of our favourites, but feel free to embrace your inner mixologist using our mix & match list. Scotch pancake, cherry compôte, indulgent Belgian chocolate ice cream, wild cherry sauce, whipped cream & brandy.